The 2017-18 college basketball season officially tipped off Friday, but both fans and bettors have tonight’s slate circled with two heavyweight matchups between teams that will undoubtedly be players in March. The majority of spread bettors (65%) have grabbed the Blue Devils with the real money splits more evenly divided as 52% of spread dollars are backing Duke. While our Bet Signals data have not triggered any sharp money indicators, the line ticking down from Michigan State +2 to +1.5 indicates that the larger wagers have taken the points so far in this matchup. The over/under moved up to 158.5 in some spots behind some sharp money. Sparty is loaded from top to bottom, with a lottery pick on the wing, one of the country’s most underrated bigs on the block and a top-shelf distributor at the point. Offensively, Tom Izzo has a reputation as an “overcoacher” of his elite talent, but he loves to run sets like the nefarious double backdoor and a lot of screening both on the ball and off (with a lot of Hawk action) because it allows his players to know where they’re going to be on any given shot. That, in turn, helps them rebound offensively – always a staple of any Izzo team. Defensively, Izzo uses his guards in a mostly pack line scheme that denies dribble drive penetration and jumping to the ball on perimeter reversals. Basically, Izzo loves to clog driving lanes to force jump shots and snag the board rather than force turnovers. Read more from Jordan Majewski. Kansas opened as a 2-point favorite at Pinnacle and the betting action has been all Jayhawks. A the time of publication, 78% of spread tickets and 96% of spread bucks have driven the line up to -4.5 at most sportsbooks across the market.. While there isn’t any sharp action to speak of on the spread, professionals have pounded this total down five points since opening at Pinnacle. Bill Self made a major schematic adjustment last year and embraced the pace and space revolution! While it was a still a staple of the offense, the ubiquitous Bill Self high-low action centered around two bigs at the 4 and 5. Thanks to Josh Jackson, Self rolled with a more positionless four-out lineup, and the results were immediately gratifying. KU’s 3-point attempt rate was the highest of the Self era, and they hit at an absurd 40 percent as a team, giving Self his most efficient offensive team in his 14 years in Lawrence. A 14th Big 12 regular season title is expected, if not a given, and Bill Self’s eighth No. 1 seed in March is also likely. Whether this team gets over the Final Four schneid is probably dependent on the defense. Read more from Jordan Majewski. As usual, John Calipari has assembled an absurd amount of talent in Lexington – but this team is even younger than the youngest Coach Cal teams of the past. While there’s almost zero experience, there’s an abundance of length, versatility, talent, lottery potential, etc. 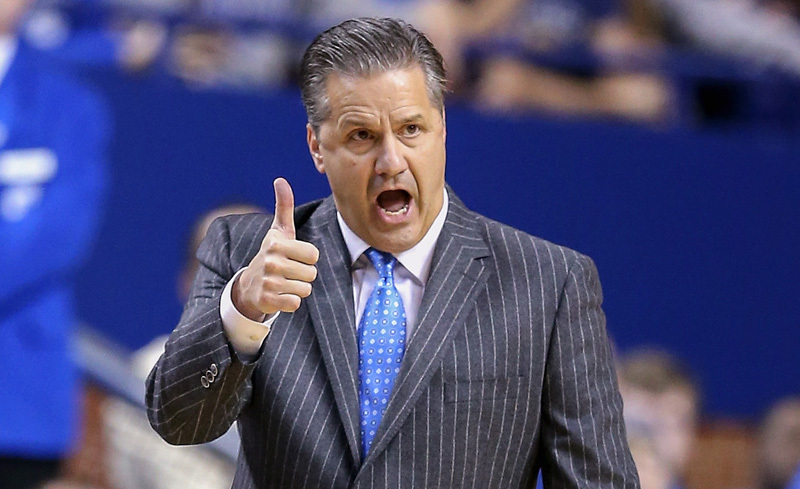 Defensively, this UK team has a chance to be one of the most efficient of all time. The only way to even find shots is essentially long two point jumpers unless you have a ridiculously quick set of penetrating guards that can disorganize the athleticism. Cal defenses always, always chase away shooters at an elite level, and with the length/athleticism combo at the rim, there’s going to be nothing to find in the paint. Can you outscheme Cal? Yep. Do they have shooting concerns? Definitely. Is there a little concern at the point with Quade Green? Sure. But the low ceiling for this team is Final Four. The easily reachable ceiling is national title. So, nothing new in Lexington. Read more from Jordan Majewski. Top 10 matchups attract the most recreational bets. With casual fans targeting these high-profile games, contrarian bettors can profit by simply going against the public. Translation: The less public support a team gets, the better they perform against the spread. The trend holds if you look specifically at Top 5 contests as well, though the sample size gets smaller. Kentucky has failed to cover in back-to-back games. More than 70% of spread bets took the Wildcats in each contest to start the season. As a result the public is on Kansas. Duke is getting a majority of bets in its game but more than 50% of spread dollars are on Michigan State.